Delvage is your #1 resource to buy and sell unique, hard-to-find collectibles online! 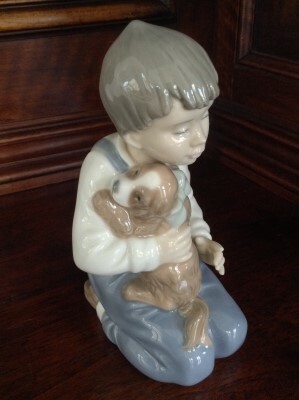 Are you looking for amazing Lenox collectibles, or are Limoges more your style? We provide those brands, along with Lladro, Longaberger, Waterford, Wedgwood, and so much more at a fraction of their original retail prices. Here at Delvage, the best place to buy and sell collectibles online, we strive to give you the greatest prices without breaking the bank! We have a fantastic inventory of special collectibles that will enhance your home and warm your heart, with new items that are added daily! Our clients’ main priority is for their items to find new homes and to stay out of landfills, and in doing that, their collectibles are offered at yard-sale prices. With new inventory daily, you never know what unique treasures you will find at Delvage! When you register with us, you are able to make product requests. We will then send an email to you when that special something has entered our inventory. You also have the ability to create a wishlist! When you add a specific product to your wishlist, we will let you know when that special gem has been discounted to the price you would be willing to pay for it! Are you downsizing or decluttering? Trust Delvage to sell your collectibles online for you! The only “work” you need to do is to determine the price for the items you plan on selling. We take care of everything else - the photographing, marketing, and shipping. Who knew it could be so easy?! Here at Delvage, we currently service parts of Pennsylvania, New Jersey, Connecticut, Virginia, and other surrounding areas, for pickups! We will be expanding our locations soon so we can help even more people who want to buy and sell their precious collectibles online! Please reach us at 844-DELVAGE (844-335-8243) or email us at customerservice@delvage.com to learn more about our services and to schedule an appointment.